Happy Monday! Let's kick this week off with gift ideas for the men in our lives, shall we? There's just over two weeks left to get everything ready, and I'm totally unprepared. Men are hard to shop for too, freal. 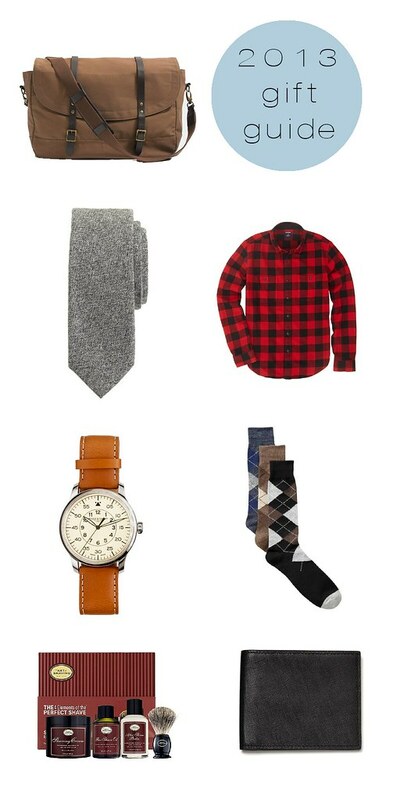 If you're looking for more gift ideas for the guys, check out the one Bonobos put together. It's seriously amazing, and full of spectacular ideas. that art of shaving suggestion is spot on - my husband loves that stuff! All the men in my family are OBSESSED. I am horrible at coming up with ideas for men! I love the idea of dress socks in the stockings! You can never go wrong with socks. SOCKS. this site actually has pretty legit jeans, surprising considering they're super-inexpensive.....talking $25-35 a pair here.... 20jeans.com. I also used twenty10 promo code to receive 10% off orders over $100!